56 W INTER 2019 PracticeLink.com Make a Difference OUR MISSION is to care for the people in our communities. Not only do we care for our neighbors, friends and families, we care for each other. Our teams are committed to continuous improvement and lifelong learning through career development, cutting- edge medical research and working with patients on their personal health journeys. Now recruiting for OB/GYN, Neurology, Dermatology, Primary Care, Orthopaedics, Psychiatry, Radiology, Urology, Hospital Medicine, Endocrinology, Gastroenterology, General Surgery, and Anesthesiology Kyle R. Hayman, DASPR Manager, Talent Acquisition kyle.r.hayman@hitchcock.org Learn more at DHProviders.org patients are people he has known for years. He even went to school with some of them. Knowing a bit about patients before they visit helps him provide better care. "It also keeps me grounded as I practice," he adds. "Patients aren't just cases of pneumonia or diabetes here. They may be old classmates, family members of old classmates, former teachers, coaches, family friends, etc." 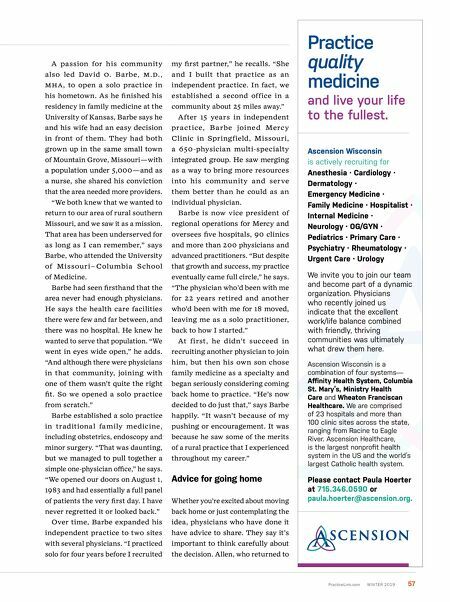 Practicing solo rural medicine W hile moving to a small rural town may not be a top choice for many physicians, others wouldn't have it any other way. 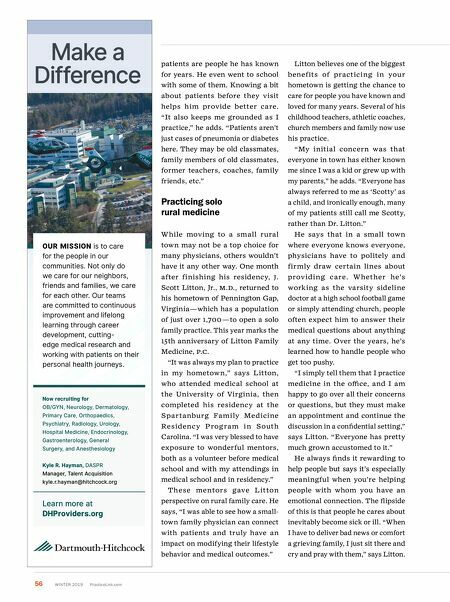 One month after finishing his residency, j . Scott Litton, Jr., M.D., returned to his hometown of Pennington Gap, Virginia — which has a population of just over 1,700 — to open a solo family practice. This year marks the 15th anniversary of Litton Family Medicine, P.C. "It was always my plan to practice in my hometown," says Litton, who attended medical school at the University of Virginia, then completed his residency at the Spartanbu rg Family Medicine Residency P rog ra m i n South Carolina. "I was very blessed to have exposure to wonderful mentors, both as a volunteer before medical school and with my attendings in medical school and in residency." T hese mentors gave Litton perspective on rural family care. He says, "I was able to see how a small- town family physician can connect with patients and truly have an impact on modifying their lifestyle behavior and medical outcomes." Litton believes one of the biggest benefits of practicing in you r hometown is getting the chance to care for people you have known and loved for many years. Several of his childhood teachers, athletic coaches, church members and family now use his practice. "My initial concern was that everyone in town has either known me since I was a kid or grew up with my parents," he adds. "Everyone has always referred to me as 'Scotty' as a child, and ironically enough, many of my patients still call me Scotty, rather than Dr. Litton." He says that in a small town where everyone knows everyone, physicians have to politely and firmly draw certain lines about prov id i ng ca re. W hether he's working as the varsity sideline doctor at a high school football game or simply attending church, people often expect him to answer their medical questions about anything at any time. Over the years, he's learned how to handle people who get too pushy. "I simply tell them that I practice medicine in the office, and I am happy to go over all their concerns or questions, but they must make an appointment and continue the discussion in a confidential setting," says Litton. "Everyone has pretty much grown accustomed to it." He always finds it rewarding to help people but says it's especially meaningful when you're helping people with whom you have an emotional connection. The flipside of this is that people he cares about inevitably become sick or ill. "When I have to deliver bad news or comfort a grieving family, I just sit there and cry and pray with them," says Litton.